After a long week of defending the recently negotiated Iran nuclear agreement to skeptics in Congress and the international community, President Obama continues to take on the laundry list of what he believes are "dishonest" criticisms against the deal. 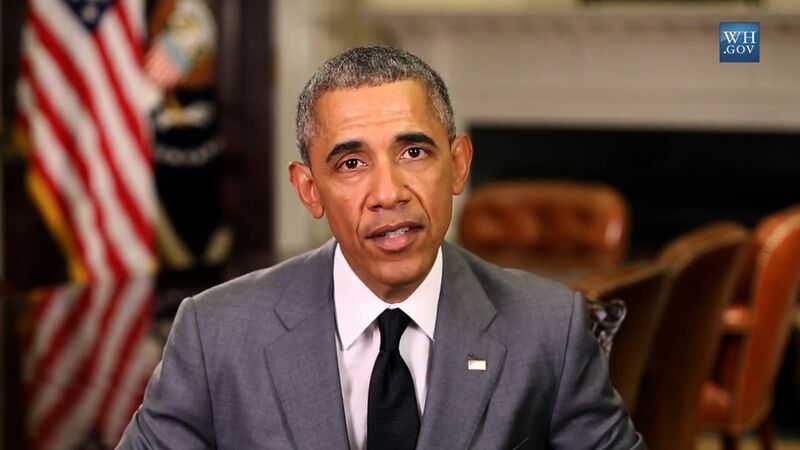 "This deal will make America and the world safer and more secure," Mr. Obama said Saturday in a video. "Still, you're going to hear a lot of overheated and often dishonest arguments about it in the weeks ahead." Congress is set to review the agreement in the coming months and has the power to undo some of its more important terms. What has many in the administration worried is the apparent opposition some in the Democratic Party have expressed. "The deal doesn't provide for the anytime, anywhere inspections that we were all talking about," Sen. Bob Menendez, D-New Jersey, said immediately after the agreement was announced. The president addressed that concern, saying that the deal includes "unprecedented, 24/7 monitoring of Iran's key nuclear facilities." Flash Points: What's next for the Iran nuclear deal? "With this deal, international inspectors will have access to Iran's entire nuclear supply chain," Mr. Obama said. "The verification process set up by this deal is comprehensive, and it is intrusive - precisely so we can make sure Iran keeps its commitments." After the 60 days allotted for congressional review, if the legislative body changes the deal, the president has already promised to issue a veto. And with the support of the United Nations Security Council, which has scheduled a Monday vote on a resolution endorsing the accord, the result of the Iran negotiations could soon become international law. Still, the president said, "you'll hear some critics argue that this deal somehow makes it easier for Iran to obtain a nuclear weapon." But Mr. Obama also refuted that claim, using the five other international stakeholders in the deal as a defense. "If you think it sounds strange that the United States, Great Britain, France, Germany, Russia, China and some of the world's best nuclear scientists would agree to something like that, you're right," the president said. "This deal actually closes off Iran's pathway to a nuclear weapon." Pushing back against criticisms that Iran faces no consequences if the country violates the terms of the nuclear agreement, the president added that such claims were "patently false." "If Iran violates this deal, the sanctions we imposed that have helped cripple the Iranian economy - the sanctions that helped make this deal possible - would snap back into place promptly," Mr. Obama said. "There's a reason this deal took so long to negotiate. Because we refused to accept a bad deal. We held out for a deal that met every one of our bottom lines," he continued. "And we got it." The president added that he would continue making his case in the coming week. On his scheduled Tuesday visit to the national convention of the Veterans of Foreign Wars, Mr. Obama plans to advocate further for the nuclear deal "because nobody understands the true cost of war better than those who've actually served in this country's uniform." In congressional Republicans' own video, the GOP pushed for replacing parts of the Dodd-Frank financial reform law ahead of its fifth anniversary. Calling it "Obamacare for our economy," House Financial Services Committee Chair Rep. Jeb Hensarling, R-Texas, said that Dodd-Frank "enshrined taxpayer-funded bailouts" of big banks rather than help the 2008 financial crisis. "It is evident that Dodd-Frank has made us less prosperous and less free," Hensarling said Saturday. "It has meant lost opportunities and frustrated dreams for millions hoping to start a small business, buy a home or plan for a secure retirement." "Instead of preventing the  crisis, misguided Washington policies helped lead us into it - policies that either strong-armed or enticed financial institutions into loaning money to people to buy homes they couldn't afford to keep," the Texas Republican said. "It wasn't deregulation that caused the crisis. It was Washington's dumb regulations." Hensarling has already started to engage Congress with regulatory hearings on the five-year-old act. In the long term, he hopes for a rewrite of the regulations with a new administration in the wings come 2016.